Geomatics is uniquely suited to the development, publication, and use of open textbooks. Here the concept of open textbooks will be introduced and the suitability of Geomatics will be examined. Geomatics (and GIS, GIScience, Cartography, Geodesy, etc.) have historic and archeological tendrils that stretch to some of the earliest artifacts related to human settlement. Furthermore, geomatics has been ever-present as humanity strove to improve, development, conquer, and acquire knowledge. This history and the dependence of modern geomatics on national interests means that the knowledge associated with teaching geomatics and related disciplines in primarily in the public domain and authors have relinquished restrictions related to copyright, intellectual property rules and laws, or other aspects of its use. Many educators view makerspaces as a means of increasing student engagement in K-12 classrooms. As faculty and staff of the College of Education at the University of Saskatchewan, we have noted low comfort levels in using and experimenting with technology. For this reason, we decided to create a place in which pre-service teachers could test and discuss technologies that they could eventually use in their teaching practice. Our endeavor eventually morphed into a space for current teachers, student teachers, technical support staff, faculty members, and interested community members. Having piloted workshops for six months, we are now evaluating our decisions and shaping new approaches for the current academic year. Our main challenges include ensuring inclusivity across age, gender, and culture; adopting suitable facilitation styles; and ensuring the workshops lead to useful discussions of technology and teaching practice. The emergence of the makerspace movement offers tremendous potential to transform learning. Learning by making, while ancient in practice, has evolved due to the development and confluence of developments in computing, communications technologies, pedagogy, and library science. In particular, online networking has enabled learners to share and engage with ideas and materials in a uniquely 21st century fashion. The makerspace activity process (MAP) framework illustrates how makerspace activities—curating, relating, and creating—are intertwined through networking practices. Makerspaces are highly contingent and transformative; both the nature of the makerspace and the participants transform each other through interaction. For those educators who find it difficult to integrate within formal curricula and assessment practices, the MAP framework provides a guide for facilitating and assessing learner activity in educational makerspaces. The framework is useful for educators at all levels from kindergarten to post-secondary. Dionne, J.F., Epp, J., Koole, M., McCoy, E. (2017). Makerspaces: Materializing, Digitizing, and Transforming Learning. In J. Keengwe & P.H. Bull (Eds. 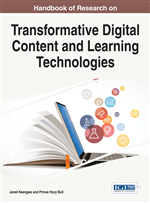 ), Handbook of Research on Transformative Digital Content and Learning Technologies. IGI Global. Canadian Journal of University Continuing Education, Vol. 40, issue 2. This report of practice describes a five-year process to establish and implement quality standards for a substantial portfolio of distance delivered courses at the Centre for Continuing and Distance Education, University of Saskatchewan. The report describes an analysis of the issues and the solutions found that led to our current curriculum design standards and procedures, the implementation of learning technologies, and the identification of issues and solutions regarding copyright law. Lastly, the future prospects of these distance-delivered post-secondary courses are considered. Focusing on the issues and solutions for each category of challenges, this report describes the five-year journey of a small instructional-design team that faced roadblocks and barriers common to many post-secondary continuing and distance education units. J. Epp, J. McKee (2015) Digging Up: A Five-Year Journey to Instructional-Design Stability in a Post-secondary Distance Education Unit, Canadian Journal of University Continuing Education, Vol. 41, issue 1. Celcius: Peer-reviewed on-line Journal, issue 1 . What follows is an attempt to scratch the surface of the dialogues that are happening within the ceramics discipline regarding the use of new media as a tool, a tool which inevitably like other tools shapes us and our studio practices. C.Epp, J.Epp (2009) Broadening Perspectives, Breaking Down Boundaries: On-line Initiatives for the Ceramic Artist, Celcius: Peer-reviewed on-line Journal, issue 1 . J.Epp, J.McKee. (2016) Digging Up: A Five-Year Journey to Instructional-Design Stability in a Post-secondary Distance Education Unit, CAUCE - CNIE Conference, Waterloo, Ontario, Canada, June 2016. J.Epp (2016) Dear LMS, I think we should see other platforms, TLt 2016, University of Regina, Regina, SK, Canada, May 2016. J.Epp, M.Koole (2016) ETC Makerspace, TLt 2016, University of Regina, Regina, SK, Canada, May 2016. J.Epp, D.Trottier. (2013) Tools, Trends and Strategies for Successful Distributed Learning II, TLt 2013, University of Saskatchewan, Saskatoon, Saskatchewan, Canada, May 01, 2013. J.Epp, D.Trottier. (2012) Tools, Trends and Strategies for Successful Distributed Learning, Tech Week 2012, University of Saskatchewan, Saskatoon, Saskatchewan, Canada, October 29, 2012. J. Epp, C. Gates, D. Trottier. (2008) Innovative Interfaces Within Reach. Teaching and Learning to the Power of Technology (TLt), Saskatoon, SK, Canada, May, 2008. J.Epp, T. Kohlruss. (2006) Camtasia for the Classroom. University of Saskatchewan’s Technology Forum: Tech Week, Saskatoon, SK. Canada, October, 2006.